Former UFC welterweight title challenger Stephen Thompson says that ex-lightweight champ Anthony "Showtime" Pettis thinks he has "Wonderboy's" number. One of the most interesting striking match-ups in the UFC has just been made at welterweight. 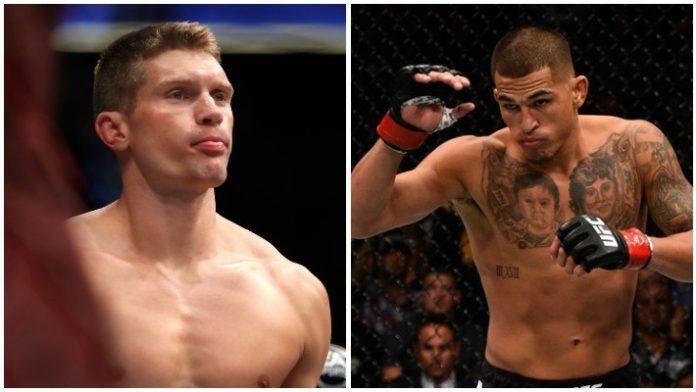 Two-time UFC welterweight title challenger Stephen Thompson will take on Anthony Pettis at UFC Nashville. This will be Pettis’ debut at 170 pounds, which takes place from the Bridgestone Arena in Nashville, Tennessee on March 23rd. “Wonderboy” was having a difficult time finding an opponent. Not having fought since May, Thompson was previously eying a fight with Robbie Lawler. However, Lawler will instead welcome former Bellator and ONE Championship welterweight king Ben Askren to the promotion. Now, Thompson will welcome former 155-pound champion “Showtime” to the welterweight division. Pettis hasn’t fought since the co-main event of UFC 229 in October. He was defeated by Tony Ferguson via TKO after being unable to get off the stool for the third round when he broke his hand. Now, after several months of recovery, Pettis will attempt to out-strike a fellow dynamic stand-up artist in Thompson. “There’s a lot of guys right now who I’d like to fight but they have fights coming up, so it just wasn’t working out for me in the 170 [matchmaking] the past few months,” Thompson said. What do you think about Thompson’s comments on Pettis?